The concept known as Prevention through Design refers to designing facilities, processes and products in a way that minimizes workplace hazards and risks not only to the people who will use them, but to those who construct them. “If you avoid bringing hazards in the workplace to begin with, you have a much higher probability of avoiding injuries and illnesses – especially serious [ones],” said Fred Manuele, president of Arlington Heights, IL-based Hazards Ltd.
PtD can benefit any industry that uses costly retrofitting to protect the safety of its workers, according to Wayne Christensen, who owns Crystal Lake, IL-based Christensen Consulting for Safety Excellence Ltd.
An example of PtD is designing in anchor points for construction workers’ fall protection systems – rather than retrofitting them in later, said John Gambatese, a professor in the School of Civil and Construction Engineering at Oregon State University in Corvallis. In addition to potentially saving lives, PtD can save organizations money by requiring minimum retrofitting after a design is complete, as well as reducing the costs associated with fatalities and severe injuries, Manuele said. However, the cost benefits associated with using PtD are not always clear, according to Michael Toole, co-director for the Institute for Leadership in Technology and Management at Bucknell University in Lewisburg, PA. Complicating these concerns is that architects and engineers may not necessarily have the proper training to fully understand the concept of PtD, said Toole, who also runs a website dedicated to how PtD can be applied to the construction industry. Although PtD has been discussed since the 1940s, it may be decades away from wide acceptance in the design and safety communities, Christensen said. One entity encouraging acceptance of PtD is NIOSH. The institute’s Prevention through Design National Initiative seeks to increase awareness and implementation of PtD in the workplace and in classrooms through research, education, practice and policy agendas, according to Donna Heidel, coordinator of NIOSH’s PtD National Initiative. 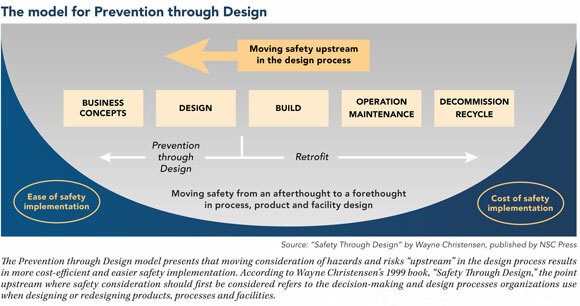 The first national voluntary PtD standard, which was published by the American National Standards Institute and the American Society of Safety Engineers in October 2011 and went into effect in January, “provides guidance on including [PtD] concepts within an occupational safety and health management system” and is applicable throughout the entire lifecycle of a “facility, process or product,” ASSE states. Download a "tech brief" on the Prevention through Design standard. Toole said the standard will have a beneficial impact on certain industries that are most in need of learning PtD concepts, such as manufacturing. It also may help reduce the costs associated with training personnel by providing them with a step-by-step guide, he added. Communication barriers between safety professionals and designers may prevent PtD from making a large impact, Toole said. Safety professionals – especially those who originate from a business academic background – may not have enough shared knowledge with designers, engineers and architects to effectively communicate about PtD, Heidel said. Goal conflicts also may exist: For safety professionals, the prevention of injuries and fatalities is their main function, while designers typically are tasked with efficiently creating processes, products and facilities, said Donald Bloswick, a professor in the Department of Mechanical Engineering at the University of Utah in Salt Lake City. NIOSH’s PtD initiative advocates for an increase in the study of safety in these designers’ curriculums, Heidel said. Safety is discussed in engineering and design schools, Bloswick said, but it usually is focused on ensuring a product or facility is designed to be used safely by workers. To him, this presents lost potential. One potential solution to bridge the gap between industries is appealing to management’s commitment to protecting its workers – including those who may not be employed by the company but are tasked with constructing a facility, Christensen said. Toole agreed, and recommended that safety professionals emphasize the human factor of designing for safety. “The end user is important, of course – but emphasize that so are the individuals building your company’s project,” he said. PtD may be viewed differently by large and small businesses, Toole said. Take a small business contracting out a construction project, for example. What responsibility do these companies have to the workers of a contractor? “It’s harder to justify that return on equity, to say, ‘Well, I am going to spend more time doing my design to help someone else.’ That is hard, because spending more time on design cuts into the design fees [of the company contracting out],” Toole said. The situation with large businesses can be different, Christensen said. He described a time when, while working for a large organization, he suggested implementing PtD concepts into a project’s design phase to avoid retrofitting. His proposal initially was met with skepticism due to financial concerns, but one of the managers backed Christensen’s idea and it eventually was implemented. There are more case studies about PtD and similar concepts involving large businesses, he said. A lack of case studies on PtD for small and midsized businesses also might prevent the concept from gaining full acceptance, Christensen said. “If small-business safety practitioners could step up to the plate via articles and shared success stories, other small and midsized businesses could say, ‘Hey, this works. It could work for me too,’” he said. Still, case studies would not have much of an impact on engineers and designers without ample academic background on PtD, said Tony Pasteris, president of Minerva Canada Safety Management Education Inc. in Ontario. As part of its mission to increase safety discussions in the classroom, Pasteris’ organization creates lesson plans and academic modules that can be used by engineering professors to teach PtD and other safety-related concepts to their students. According to Gambatese, it would be helpful for associations and government agencies to provide as many resources as possible so professors can easily integrate PtD into their lectures. He also noted that these professors could invite industry speakers to discuss PtD, as well as bring students into the field more often. Gambatese advocates the use of pre-made modules so professors do not have to research and develop them independently. For maximum exposure, safety should be integrated entirely throughout students’ curriculums, according to Pasteris. Gambatese said safety and PtD concepts would work best integrated into the existing curriculum rather than acting as an add-on and, at the least, students should be told about the importance of safety early on in their academic career. Although strides are being made to further the national discussion on PtD, widespread diffusion of the concept in industry is years away, Toole believes. Pasteris said the United States is behind on this topic, and it will take more research, more time and a change of safety culture before PtD is implemented. Christensen said he hopes PtD will gain wider acceptance sooner than later. At the end of the day, “putting the time and effort into this, the time and resources to learn about it, and then implement it, is what it all is about and the reason why it is not widespread yet,” Gambatese said.